In 26 years I’ve eaten a lot of food. More than I care to admit, honestly. Though, like everyone, I have my favorites, nothing made an impression quite like my trip to Pó with my brother last week. Since we don’t often get to go to fancy restaurants, we arrived a little too dressy for a Tuesday night with minimal cares. While waiting for our table, we kick started our meal with our first bottle of wine, a Syrah ’06, from Nadir, Tenuta Rapitala. Though admittedly neither of us are wine connoisseurs, we more than enjoyed our selection. We went with the cheaper option for obvious reasons, but the Pó wine menu featured plenty of higher quality bottles for those with a more delicate wine palate and heavier wallets than ours. As are all Pó customers, we were provided with a sampling of the white bean bruschetta before we ordered our meals and were very grateful for that. I’m not much of a bruschetta fan, but I found the addition of white beans to this traditional Italian appetizer to be a welcome and very delicious change for me. My brother (Tyler) and I ordered the same salad, as we’re not only related–we’re pretty much the same person. Due to our love of mushrooms (the edible kind! 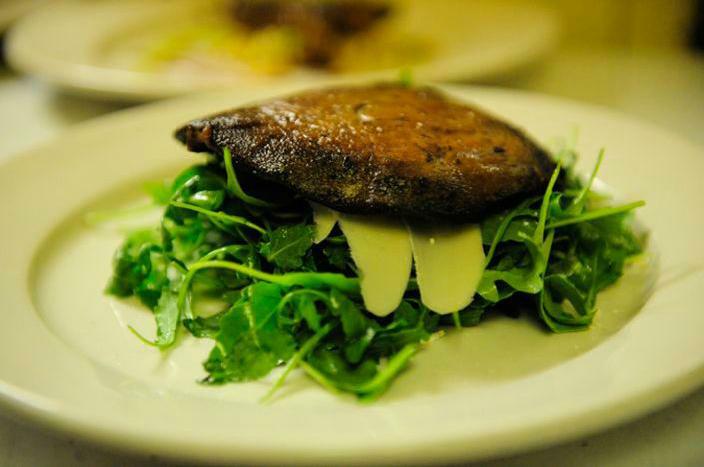 ), we both settled on the Grilled Portobello with arugula and shaved parmigiano-reggiano. I’m a writer, so I’m pretty adept at finding words to describe my feelings. In this case, I can only say that I almost cried into my salad. I will literally testify that the Grilled Portobello from Pó is the most delectable, savory and delicious sampling of food I have ever introduced to my tongue. A day hasn’t gone by since our dinner when I haven’t imagined eating it again. Just as we finished salivating over the salads, our respective meals were delivered. Tyler went for the Veal Marsala and I couldn’t resist the Grilled Skirt Steak. Obviously I tried mine first and liked it the best. Accompanied by roasted potatoes, escarole and gorgonzola butter, my medium-rare steak was so tender my brother cut his sample from my plate using only his fork. The man behind the idea of combining these ingredients is well-deserving of a recognized award for his genius. I’m a huge fan of escarole, and its combination with the steak, butter and potatoes was nothing short of wonderful. Between the two of us, we didn’t leave a scrap. Of course I wasn’t going to let my dinner go by without snatching a piece of the veal, also served with escarole and a plethora of other ingredients including crimini mushrooms, shallots, sage and truffle oil. While I very much loved the veal and the flavors Pó combined, the flavor in the veal marsala was not quite as strong as the grilled portobello or skirt steak, which left the tiniest bit of wanting. This in no way means the veal was less than satisfactory. It was also extremely tasty. Just not as good as my steak! Despite the fact that we were both completely stuffed on salad, steak, veal and our two bottles of wine, it didn’t seem acceptable to leave Pó without at least trying a dessert. With entrees as delicious as these, it was near impossible to even imagine the dessert. After less contemplation than I would have imagined, we decided to share a Pó Sundae composed of mint gelato, cinnamon spiced pine nuts and chocolate sauce. I don’t really feel the need to say more. Just look at the ingredients. It was phenomenal, even down to the gelato, which Tyler dubbed the best mint ice cream he’d ever tasted. For those of you who don’t know my brother, that’s a hell of a compliment. 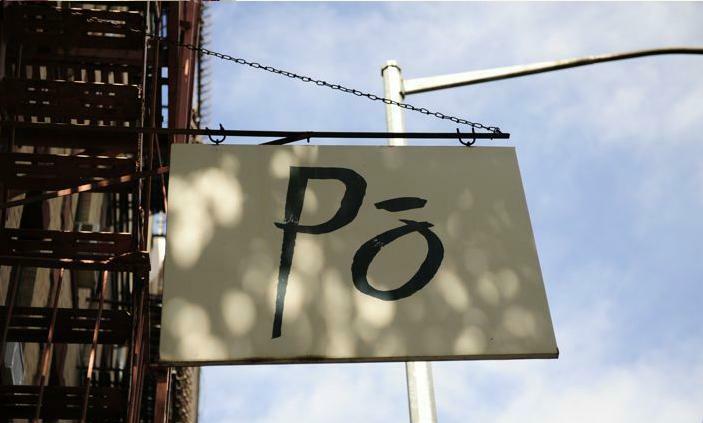 Not only was the food insanely good, the service at Pó was outstanding. We definitely felt a bit out of place in such an elegant restaurant, but the waitstaff would have none of that and treated us like they couldn’t be happier to have us. The feeling was so very mutual. Though we stayed for over two hours, never once were we shooed, prematurely given the check or glared at. For a New Yorker, that’s worth more than so many other things. Thanks to the crew at Pó and their creative combinations of fresh, ambrosial salads, entrees and desserts, my date night with my visiting brother was nothing short of absolutely unforgettable.